The Resonants were featured on the ArtSound.fm Concert Hall program this Sunday past, airing the September concert On The Air Are Born. Don't miss an opportunity to catch a repeat on Wednesday 16 January @ 1:30 - 3:30 PM! 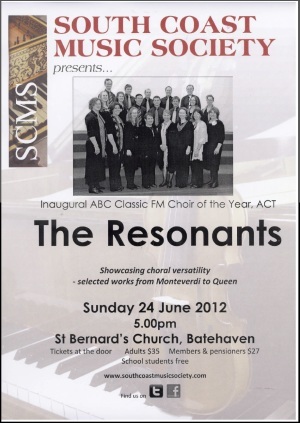 The Resonants have been hard at work in recent months. Following on from a successful weekend away at Batehaven and a short mid-winter break, the group pulled together a couple of sets of music for the Australian National Eisteddfod at Canberra Girls Grammar School in August. Unfortunately, we were pipped at the post by the ever-impressive University of Newcastle Chamber Choir in all three of our categories, but we were awarded an "honourable mention" and a recording session with ArtSound FM. We're planning to use that session to record our Liam Waterford pieces On the air are born which we're premiering at our 22 September concert (see the concerts page for details). Also in August, the ladies of The Resonants performed with the Canberra Symphony Orchestra's presentation of Holst's The Planets at Llewellyn Hall, ANU. It's always great fun to sing with a full orchestra and conductor Nicholas Milton always demands the highest of professional standards. We had an unusual role, though - we sang the ethereal final movement of the suite from the corridor, finishing mysteriously outside the closed auditorium doors. September has been spent madly rehearsing for our 22 September concert. We like to keep ourselves challenged, so in addition to the wonderful Waterford music, the title piece of our concert, we are trying our hand - or rather, our voices - at poetry by Timoshenko Aslanides, and Bach's Lobet den Herrn, as well as some lyrical and lighter songs. Join us! South coast concert "first class"
The South Coast Music Society Concert has been lauded as "first class" and "an uplifting concert". The choir sang beautifully, some shaky rehearsals notwithstanding! Many thanks to everyone that contributed to making this an enjoyable and successful concert. Take a moment to look at the photo album and share in the memories. Click on the image for a PDF of the concert poster. Thank you to those who attended our evening concert of sacred and secular choral music on Saturday 3rd December. The concert ‘A Mighty Day,' featured Christmas songs, carols and highlights from Handel's Messiah. The program included unaccompanied and accompanied pieces with organ, clarinet and viola instrumentalists. Proceeds from this concert will be donated to Marymead, a community-based not-for-profit organisation with a 43-year history of supporting vulnerable and disadvantaged children and families.